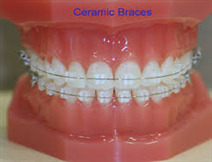 Ceramic braces are made of clear material, and are therefore less visible on your teeth than metal braces. For this reason, ceramic braces are mainly used on older teenagers and adult patients who have cosmetic concerns. While they are visually less prominent, they require the same strict attention to oral hygiene. For aesthetic reasons, ceramic braces tend to be used more on upper front teeth than on lower teeth.